As big as this quilt is (88" x 99"), it was really fun to make. I don't often feel that way about queen-sized quilts because they are just so heavy and difficult to maneuver through my machine. 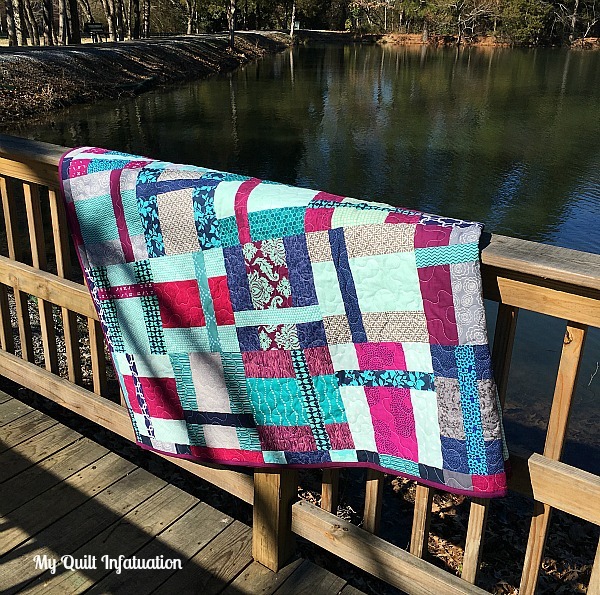 Well, cumbersome or not, this quilt includes the most stunning combination of colors, and even though I worried at first that it might be a little too dark, once I started pulling the fabrics, I was smitten with them. 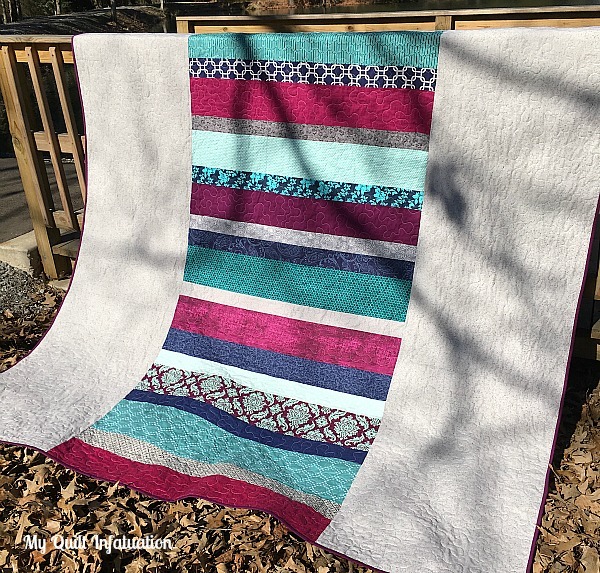 The direction of the strips creates a cool, disjointed look, kind of like the quilt has been scrambled, and I've decided to name the quilt and pattern Interference. The block is pretty straightforward, but I love the effect. 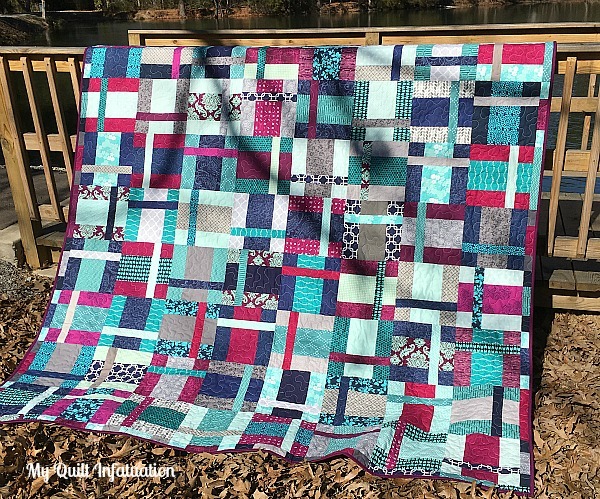 I must say that the trickiest part of this quilt was finding enough fabric variety in that shade of dark berry, which is in that perfect sweet spot between pink and purple (navy, aqua, gray, and teal were easy). Not very long ago, that berry color seemed to be everywhere, but not so much now. Everything I found in my local shops was either too pink, too red, or too purple. I ended up ordering a few things online and hoping for the best, but also consulting with one of the best local sources of awesome, modern fabric I know- Janet at Simply Pieced. That girl has a stash that can make you go weak in the knees, and unless she is saving fabric for a specific project, she is always willing to stash-swap to help out a friend. Although Janet has stepped back from her blog a little bit lately, she is still very involved in our local guild activities, and I knew she would come to the rescue in my hour of fabric need. And let me tell you- she did not disappoint. Many of the berry fabrics in this quilt are from her. I used the leftover WOF strips on the backing, because you know I can't help myself. I have to have lots and lots of print variety, which means lots and lots of leftovers. Without a solid plan to use all of that fabric, I might have to start buying less (not going to happen). And on the binding, there's that beautiful berry again. Kona Berry to be precise, which is the deepest shade of berry in the quilt. 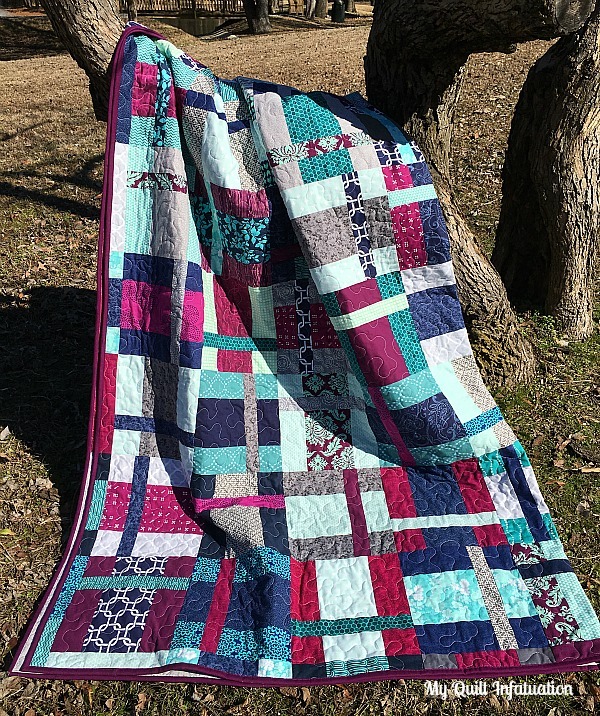 I thought that binding in the deepest shade would contain some of the crazy going on in the quilt, and I think it definitely does! The Interference pattern is already in the works, and here's a peek at the cover! So...the new venture. You know, sometimes an idea just has to stew until it's good and ready to be shared, and I've been stewing on this one for quite awhile. I don't know if you've noticed (because it has only been there for a couple of days), but I have a new "Teaching" page button. I have decided to start presenting lectures/trunk shows, and classes, because you know, I am a teacher, after all! Several people have asked me about it over the past few months, and I just had to wrap my head around it before jumping in. That being said, I would love to be able to present/teach at one of your guild meetings or retreats, meet you in person, and create something amazing. Just send me an email for details. You can check out the lectures/trunk shows and classes I'm offering HERE. Happy weekend, all! The quilt is just the right amount of crazy for me, but that back would be just the right level for my hubby. Well done! I suspect that 'berry' that you are remembering was the year of "Radiant Orchid", which was a nice color. Good luck with the teaching! Lovely quilt - yes the bigger the quilter the more to quilt! This is a gorgeous quilt! Love the beautiful colors and great pattern. This is one of my favorite color combos from you!! Congratulations on your new venture ... you will love the socialization I'm sure! Congratulations on the new pattern and best washes on your new venture. Tremendous! I cannot wait for the pattern to be released! Love the quilt - went through the same thing looking for "berry" a couple of years ago, I feel your pain! I'm so glad you're going to be teaching classes, I will be talking to my guild! Lovin' it! A bunch of my favourite colours all together - does it get any better than this? I think that is one of the prettiest quilts I've seen lately. Those colors are some of my favorites and you nailed it with the pattern too. I love the back piecing to tie it all together. What a perfect ending to a perfect quilt. 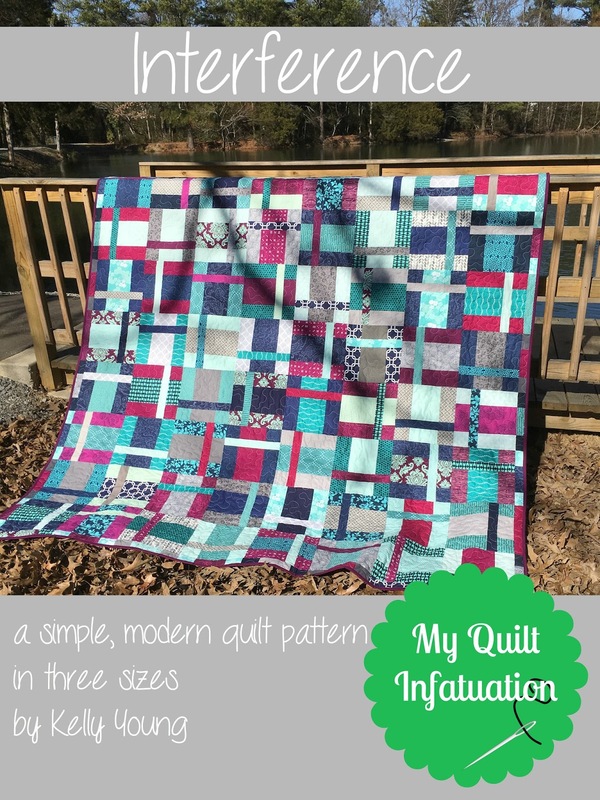 I love, love, love this quilt! The colours are fabulous, the blocks are interesting without being visually overwhelming - it's my idea of perfect! Thanks so much for sharing...I think this is on my 206 quilting bucket list! I adore the colors in your quilt. That is the PERFECT berry! This one is so simple yet so striking. Well done. Love your choice of colors too, especially the berry. Congratulations on this big and beautiful finish. Love the berry binding! And also congratulations on your decision to start offering trunk shows and workshops, Kelly! That is so exciting! This is a great quilt pattern! Congratulations on your new ventures. I love the effect created by this block! The colours are gorgeous together. Congratulations on taking the leap into teaching/presenting and I hope you have a lot of fun with it! Wonderful combo of color and design. Congrats to branching out in your quilting endeavors! Congrats on the newest venture in your quilting career! Yes, teaching is definitely your next step. This latest pattern is beautiful. It reminds me of a plaid (which I love) but without all the hassle of trying to get the strips over/under in the right spots. Pretty awesome, Kelly! I love your block/pattern. And yay! for Janet coming to the rescue with the berry fabrics. I've had the same problem with a few colors lately, but no Janet nearby to help out. She's awesome!